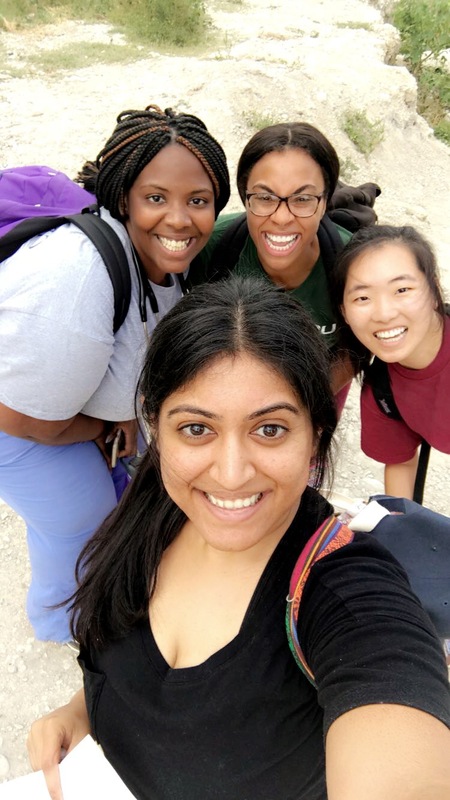 Every clinical rotation provides its own unique challenges, lessons, and professional growth. However, our time in Cap-Haïtien met these marks tenfold. 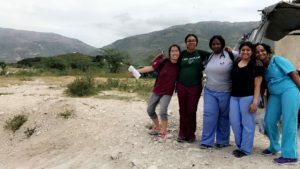 The calling of our profession is to serve, and while the people we worked with expressed their gratitude for our thorough assessments and treatments, we each gained far more from the Haitian people than we were able to provide. The complexity of healthcare in Haiti cannot be experienced fully in two weeks or expressed in a single blog post. For those of us who have never lived without clean water or consistent electricity, even immersion is not enough to develop true sympathy. We witnessed resilience, heartache, suffering, and joy that doesn’t conform into to words. 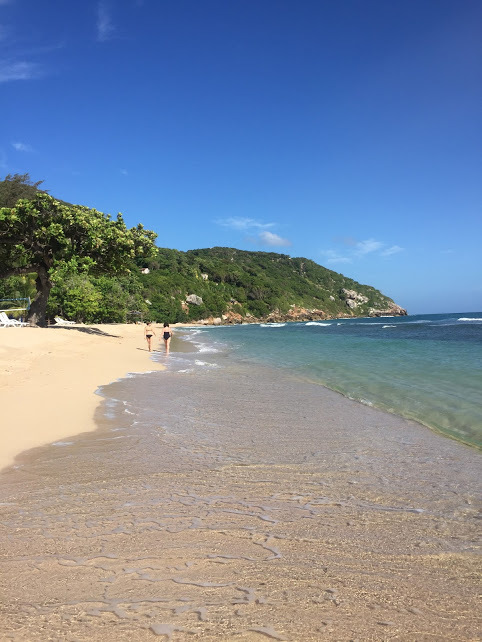 Our final day in Haiti was spent on an idyllic beach on the northernmost coast. We all welcomed the reprieve to process our time together, discuss the things we had seen and felt, and soak up of the beauty of Haiti. 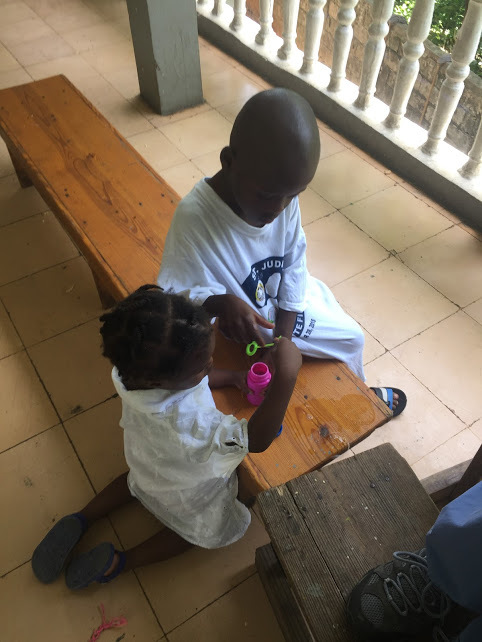 On Tuesday, we headed out of the beautiful Mont Joli and returned to Hope Haven, where we would be completing well child checks for the day. These checks consisted of not only gathering histories and performing head to toe assessments but also conducting developmental assessments. We were provided with Ages and Stages worksheets to guide us. These forms are typically provided to parents to fill out in the US at every well child check and assist with the provider’s assessment of the development in children in terms of communication, language, fine motor skills, and problem-solving. 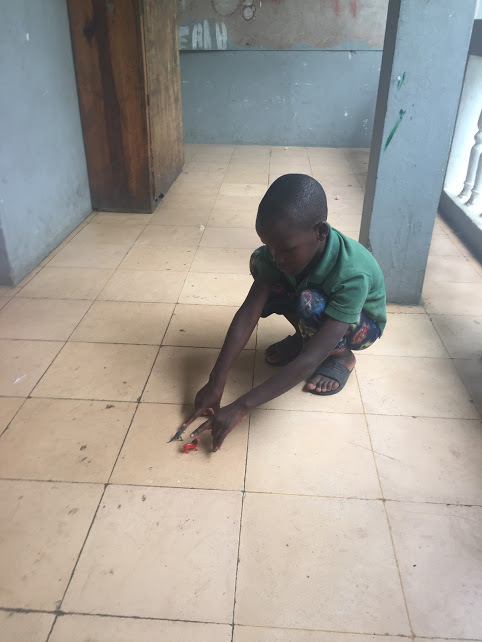 asked us to focus on establishing trust through playful interactions and gathering objective data, so this was an opportunity to sharpen our head to toe assessments and to appreciate the value in simply enjoying the children we played. In addition to completing the well child checks, we also found that many of these children had similar conditions as others within the community, such as scabies and parasites. We provided treatment and discussed what educational information we would want to provide families with children with these conditions with Dr. Bussenius. 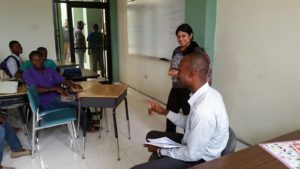 This gave us the chance to brainstorm and formulate plans from the role as the provider, with constructive feedback still being provided to us by our instructor. After completing these assessments, we stayed with the children to share in some of the toys, clothes, and treats we brought them from home. Seeing the smiles on their faces and the joy in their eyes simply from the attention we were giving them was truly heartwarming. Monday morning, we woke up ready to set up clinic at the airport. Our day was soon delayed when poor Nicole woke up vomiting. As soon as her first dose of Phenergan was given we headed to the airport. 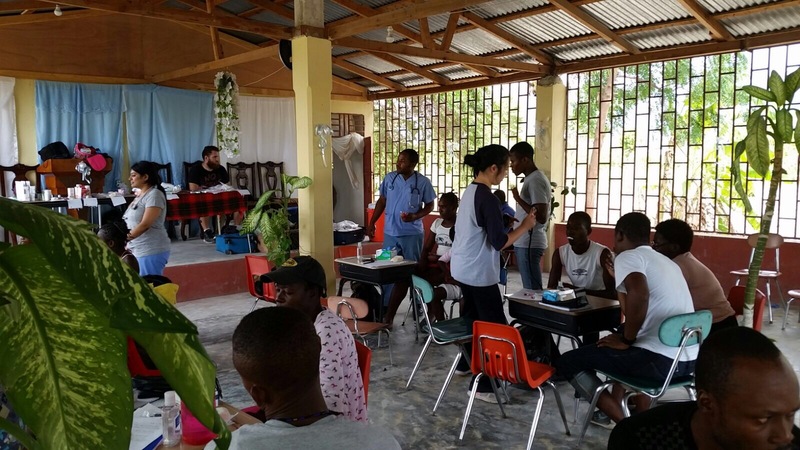 For the next few hours we provided care to the staff at the Cap-Haïtien airport. 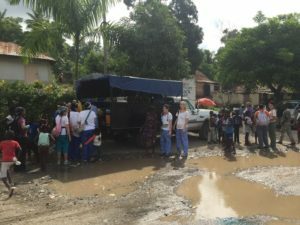 On this day, we saw about 50 patients. Since it was a smaller population we are able to go to the pool and relax after our clinic. Throughout our afternoon a few more of us began to get sick. This was no surprise to us after doing a little research from the CDC. 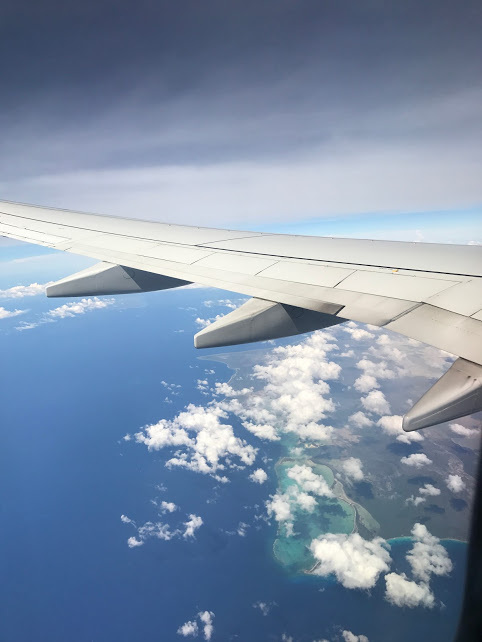 We found “Protozoal pathogens generally have an incubation period of 1-2 weeks and rarely present in the first few days of travel”. According to guidelines, the sick began taking Flagyl and azithromycin. After dinner, we all crowded in Nicole’s room and took care of her. If you have to be sick when away from home, it’s best to be with nurses! Over the next few days, we had many kinds of adventures in our new environment. 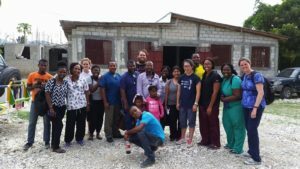 Each of our clinic sites boasted unique patients, surroundings, and experiences. From the rural mountainside to the private inner-city clinic, we have treated numerous infants, children, and adults principally for infectious etiologies including scabies, giardia, nematodes, and helminths. 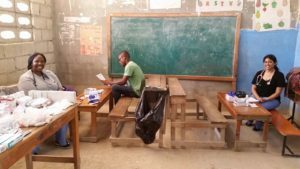 One unique case that required additional facilitation from the Lillian Carter Center was a young man with pronounced elephantiasis secondary to lymphatic filariasis. 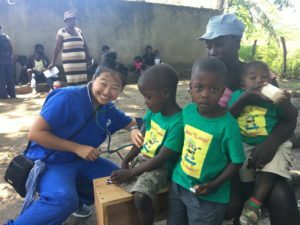 He will be traveling the length of Haiti to see a specialist on the Southern Coast. 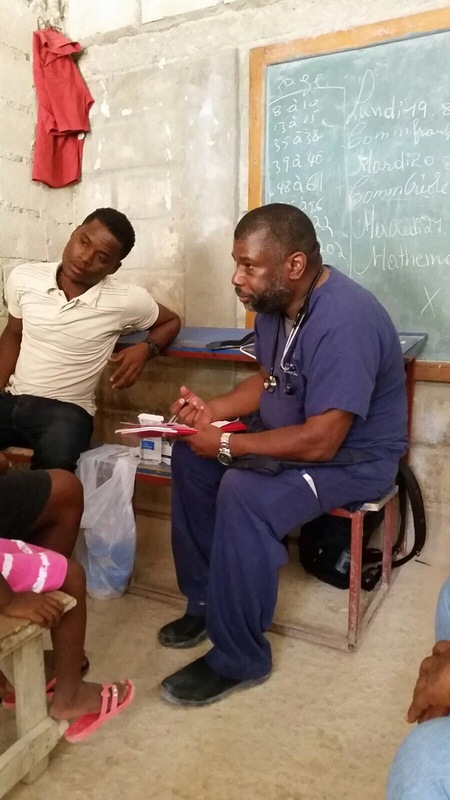 We have begun to understand the challenges of continuity of care within the Haitian healthcare system. 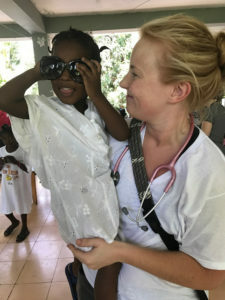 For example, we have continued to monitor the care of the child transferred to the local hospital where is he being worked up for both HIV and TB. With the help of Eternal Hope in Haiti, he will continue to receive care, regardless of ability to pay. Several of our FNP students had a crash course in the management of sexually transmitted infections and family planning; multiple young women were seen back to back with concerns about reproductive health. 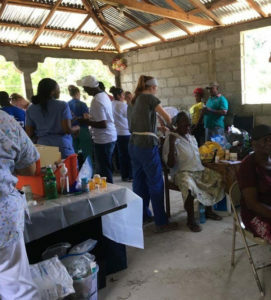 The team was able to provide them with extensive education regarding barrier protection and availability of multiple forms of birth control, including Depo-Provera and Nexplanon, at the nearby women’s health clinic. We have valued our hours off as well. Traversing the Iron Market, where all the locals purchase their clothing, housewares, produce, and meat – sometimes while it is still alive! 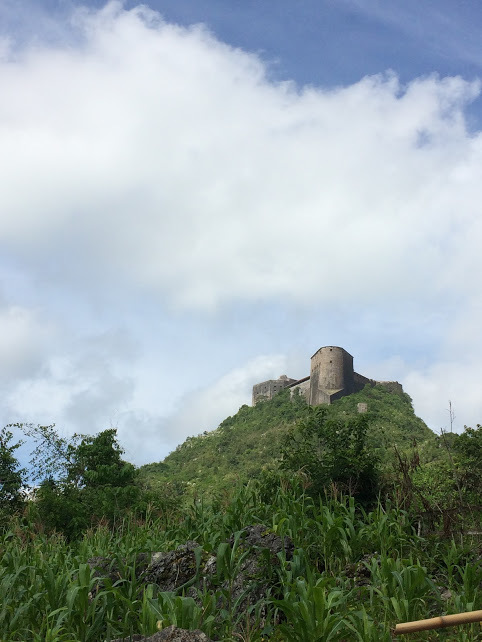 – was a view into Haitian culture that few foreigners can experience. 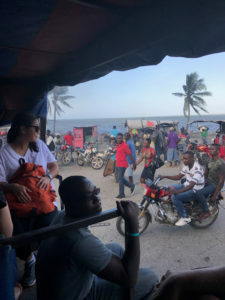 Haggling at the souvenir markets gave us the opportunity to test our burgeoning Creole. The Citadel, a massive fortress built in the early 1800’s that overlooks the city, provided stunning views of the surrounding mountains and an insight into the complex history of the Haitian government. 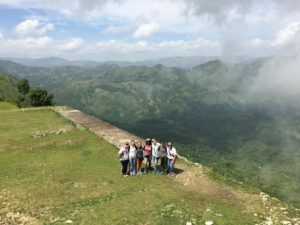 Note: Wi-Fi in Northern Haiti has been spotty due to frequent storms and power outages. We are thrilled to belatedly share our adventures! Our day began Monday morning in Atlanta. 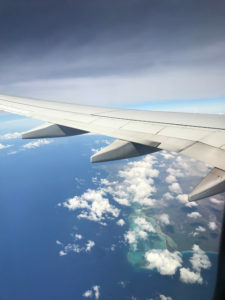 We caught an early flight to Miami. After a short layover and some Cuban sandwiches, we continued to our final destination: Cap-Haïtien, located on the Northern Coast of Haiti. 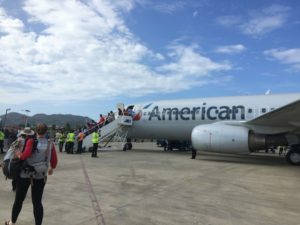 We deplaned on the tarmac and jostled our way into the crowded immigration line. Looking for our baggage… we found that it was directly in front of us in the single roomed international airport. Breezing through the Customs Officers’ inspections, we went outside to meet our fearless leader Dr. Bussenius. We were whisked away in the tap-tap, the double-wide, open bed truck that would remain our sole source of transportation. 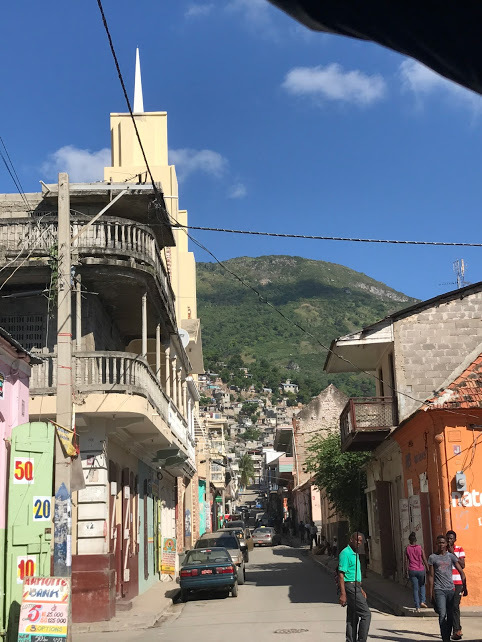 Wilnick, our constant companion and Haitian guide, rode with us through the bustling city and up the steep hill to arrive at the lovely Mont Joli Hotel. We made our way down the flowered path to our rooms. After dinner, we settled in for the night excited to begin our immersion clinical experience. On our first clinic day, we awoke bright and early, excited to get to work. We piled into the truck and started off through town. We were surprised to find that Cap Haitien has a rush hour to rival Atlanta’s! 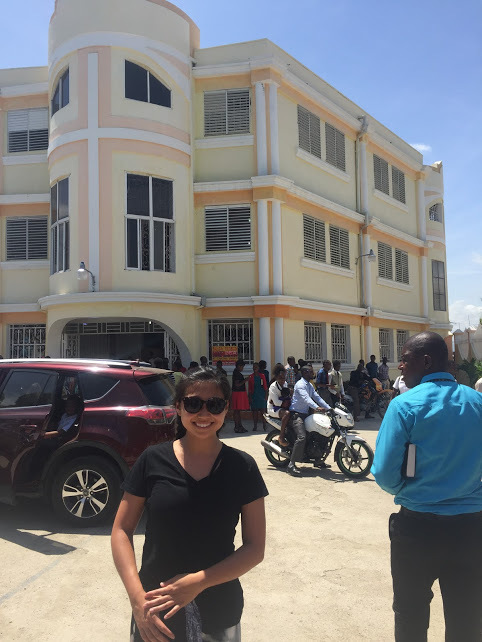 After we got past the traffic, we stopped at the women’s hospital and dropped off two of our students to work for the day. The rest continued, past the sugarcane fields, down a long county road line with grazing cattle and goats. 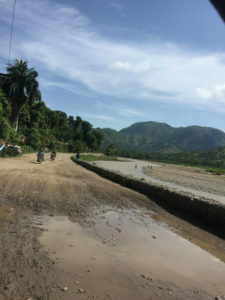 Nearing the end of the drive, we were greeted by many people, young and old, walking down the dirt road towards the Eternal Hope Orphanage. We stopped briefly at the metal gate, which was let open by a guard. The truck drove through and the gate quickly closed again. 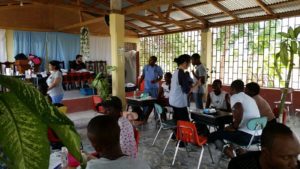 We hopped off the truck and began setting up the clinic in the shady courtyard of the orphanage. 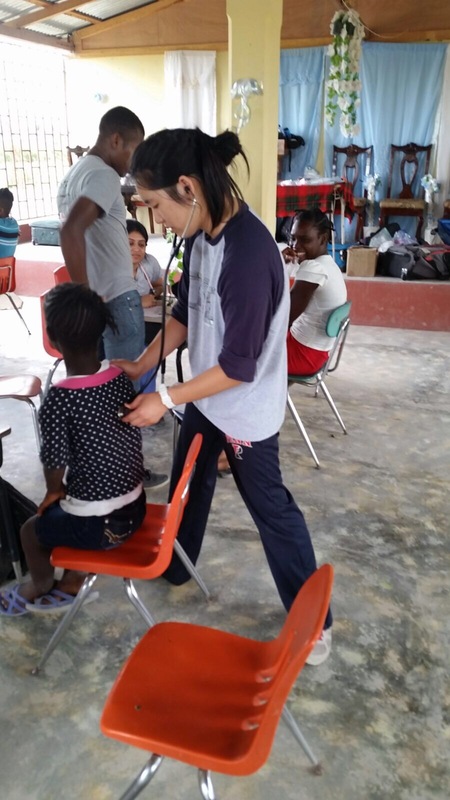 Several members of the team went outside of the gates and began triaging pediatric and adult patients. 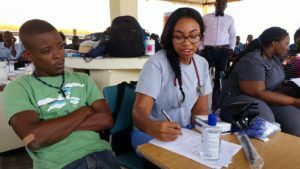 Our busy outdoor clinic buzzed with activity as adult and pediatric patients were seen and treated at several different stations. A child was found to be so ill that he needed to be taken to a nearby hospital; two students accompanied him along with our trusted driver, Luken. 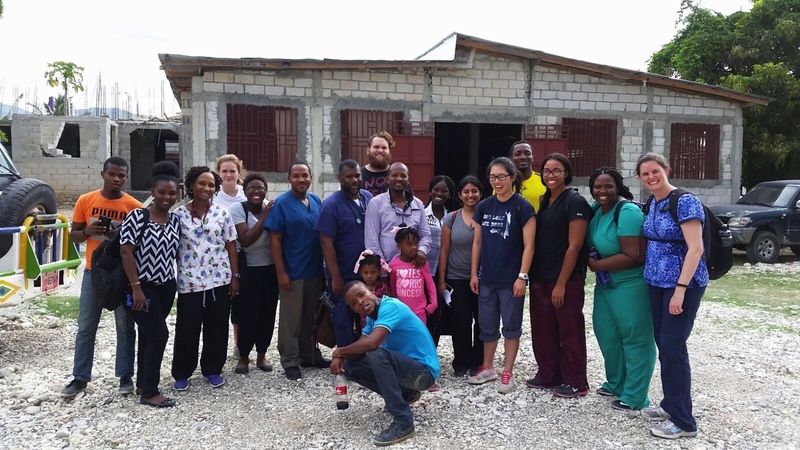 With supplies running low, we finished up clinic in the early evening. 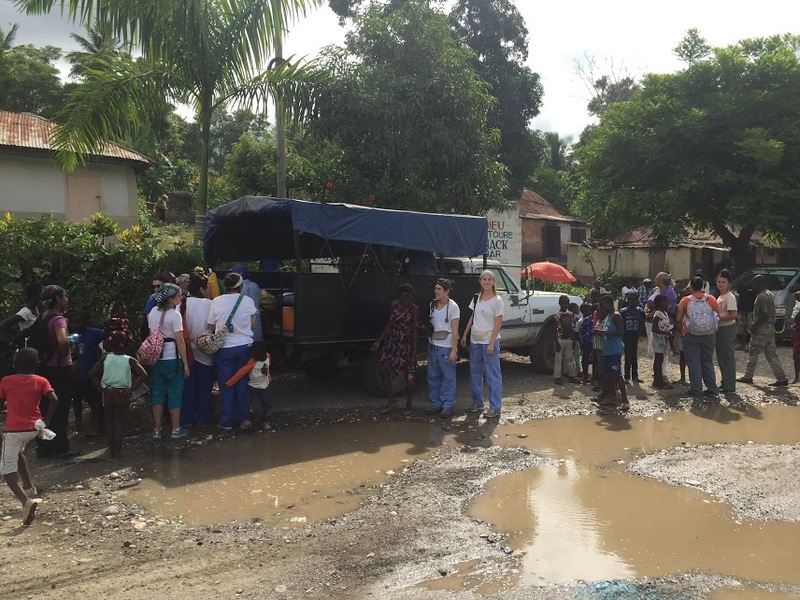 We saw 300 patients, more than had ever been seen on a single day. We headed back to the hotel, tired but happy at the end of a full day. 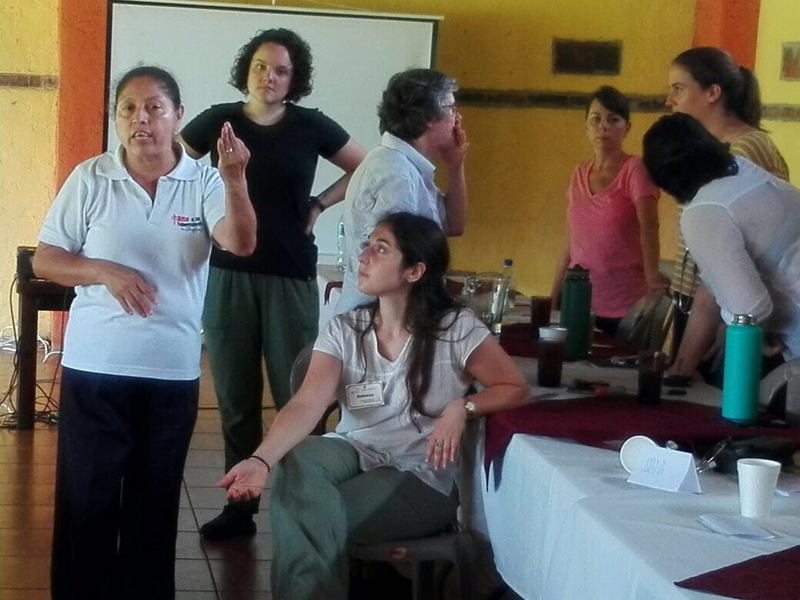 This past Friday, Monday, and Tuesday we spent time with the midwives of Carchá teaching them the same three topics that we taught the midwives in Chisec. That’s where the similarities end though. This group of midwives was vastly different from our first. There was a wider range of education to begin with, some couldn’t write or read and others who could read and write in multiple languages. There were women who were activists trying to fight for more rights for midwives. 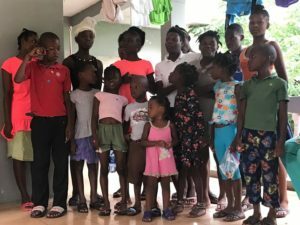 There was a mother of 19 who had delivered all of her babies herself – two of her daughters were there as midwives with her. There was a woman who had been a nurse for the government and changed to become a midwife. I like to think that the six days we spent teaching these midwives has changed us all. We complain about salaries and hours and working conditions in the States, but it’s nothing compared to these women. They don’t get paid for anything that they do. They are on call 24/7. They don’t get vacations or sick leave. They walk at night for miles without lights to show them the way and then deliver babies on dirt floors by candlelight. I know they don’t have the same risk of malpractice – but they have a greater risk of maternal/fetal morbidity and mortality. While I would like to say that all midwives in the States do what they do because they love it, I’d also like to think I’m not naive enough to believe that. The midwives here do this because they view it as a calling from a higher power. They do it for the love of their community and the love of their women. They do it in spite of constantly being put down by the government, of constantly being scorned, of constantly being waved off like they are unimportant – like they’re something less than others. I’m just in awe of them. Teaching here was harder for all those who did it. We’re tired and languages are harder when your brain isn’t firing as sharply as it normally does. We all struggled to understand and to communicate. We struggled to accommodate the variety of educational levels. We struggled with illnesses taking out two of our more proficient speakers on the last two days. We struggled with patience for each other. It’s definitely been a harder go this time around on all fronts. We spent the last two days with complete immersion into the Haitian culture. 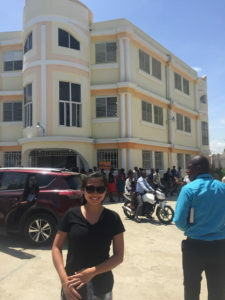 We started Saturday morning at Complexe Educatif Men Nan Men which is a multi-lingual school funded by Foundation For Peace in pursuit of teaching English, Spanish, French, and computer classes for less than $4 to the student. The students were quite curious and eager in asking questions about the American culture and our perspective of Haiti. Christine (left) and Ektaa (right) conducting English classes. Later in the afternoon, we set up a clinic in the schoolyard where we saw about 80 students. 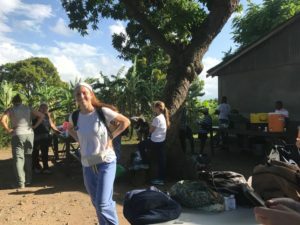 What was unique about this experience was that some of the students helped in translating; they were very ecstatic to practice speaking the English they have been learning for the past few months. We attended a Haitian church service on Sunday morning at Pastor Valentin’s church. 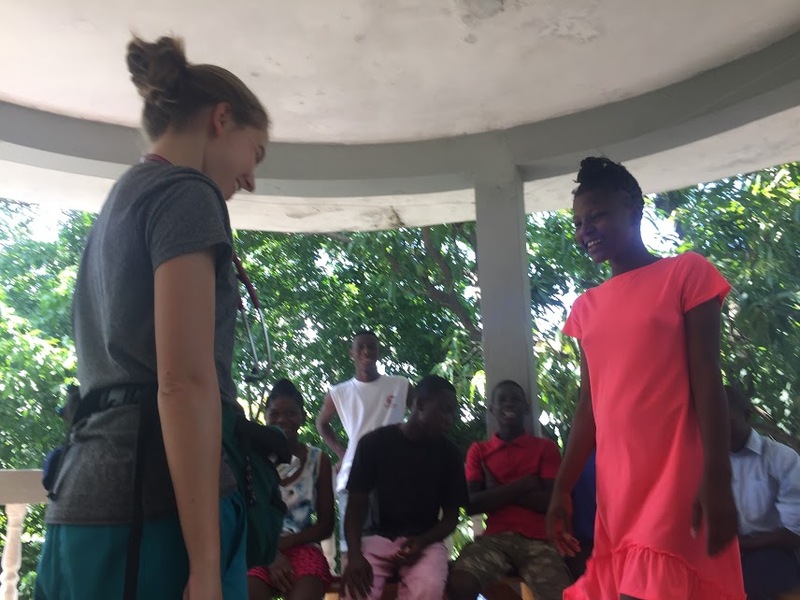 We were greeted by a very friendly community and participated in singing and dancing at the church that was led by only children. It was great to see how involved the children were in putting this event together. Our leader, Helen, thanking the church members for a warm welcome. 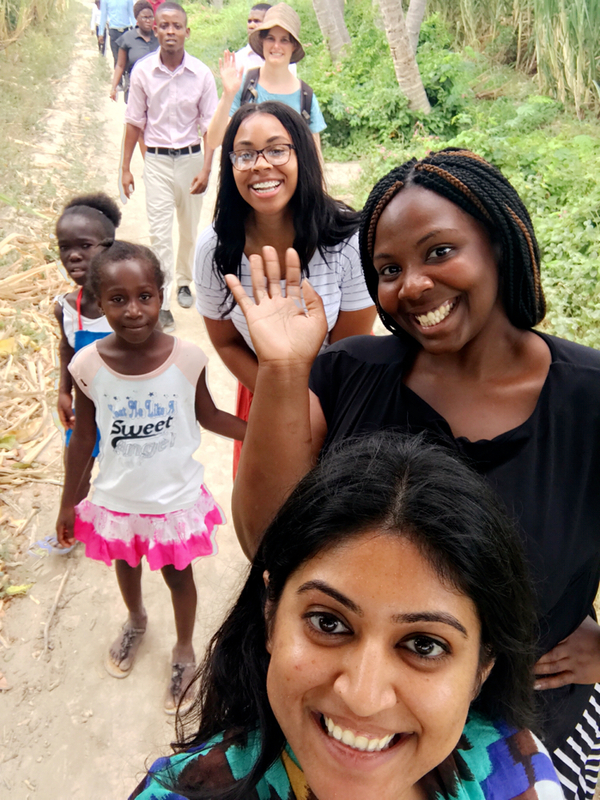 Shortly after the service, we were guided by the Foundation For Peace staff to tour the local community. 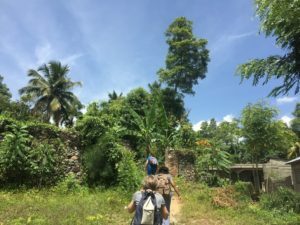 We took a bit of a scenic hike through many fields to a small village where church members live. 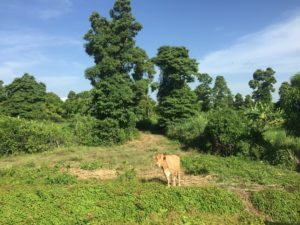 They were living in quite unfortunate circumstances where a small hut would be home to at least 8 people. Despite their living conditions, the people of the community welcomed us with open arms. Days two and three were a whirlwind, as we embarked upon an adventure in the villages of Kwa Kok and Jaquet. Within two days we were able to see greater than 200 patients. 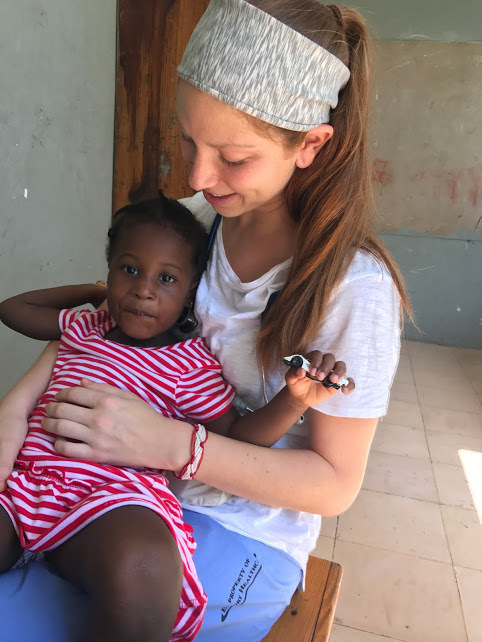 Making diagnosis were drastically altered by the norms of the Haitian culture and prevalences of diseases in the community such as malaria, dehydration, typhoid, parasites, and nutritional deficiencies. We were able to gather information from our patients with the help of our hardworking interpreters, who worked hard at gathering appropriate patient history. 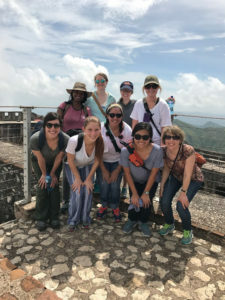 They also went above and beyond about educating us on Haitian culture. The eve of both clinical days were spent sorting and labeling medications appropriate for our patient population. In comparison to the US when treating our patients we were often unable to use first line treatment, we were required to be creative with our medication choices. Despite the overwhelming amount of patients seen we were able to work well as a team and meet the needs of our patients. Afternoon storms are becoming a normal part of our routine – I think that they’re the only thing that actually runs on schedule here. Those of us who need internet, for homework or more leisurely activities like Netflix viewing, are watching the clouds and lightening roll in from the open, covered area where we get internet at this hotel. It’s making things significantly cooler here, which is such a blessing. 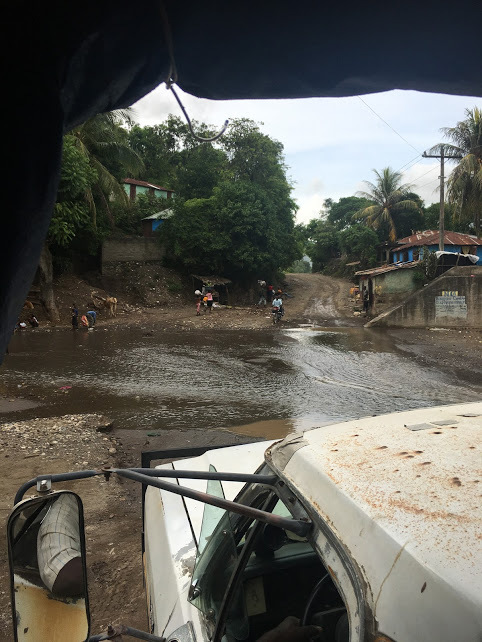 The rainy season has begun in Guatemala, which means that the entire night was filled with rain falling on the tin roof of our room and that the entire day felt sticky and hot. This morning, as the midwives started walking into the courtyard this bubble of excitement overwhelmed the table that where we were all sitting. We wanted so badly to go and greet them, and know them, and express our appreciation for them being there. Two issues with that desire: we didn’t want to overwhelm them and none of us speak their native language. Instead we settled for the traditional “Buenas días” and a pat on the arm/kiss on the cheek as they headed to our conference area. Rebecca Gloss and Hannah Lake-Rayburn did the teaching today. 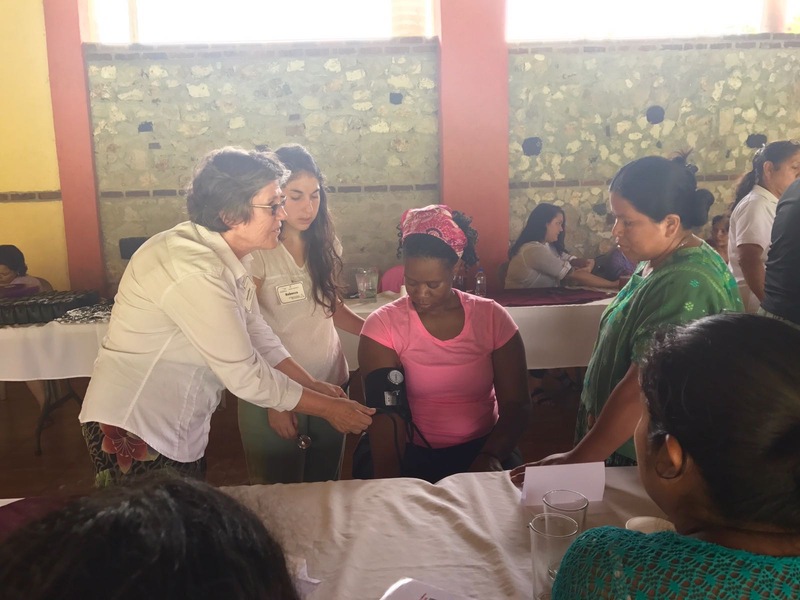 The spent the entire morning dialoguing with the midwives about high blood pressure during pregnancy, preeclampsia, symptoms of these conditions, and when women were traditionally referred out. 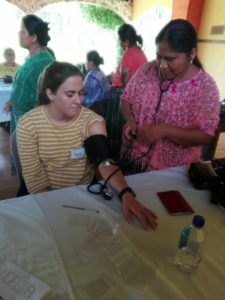 We then broke off into small groups and taught these midwives how to take blood pressures using the BP cuffs and stethoscopes we brought down for them. 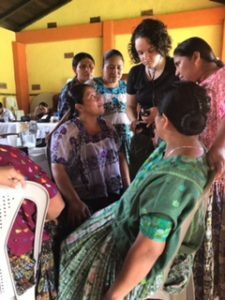 It was so exciting to realize how veracious these people are to learn new skills and about new equipment that they knew would help the women that they love so much. Not that this teaching didn’t come without challenges: the majority of our group speaks some Spanish, but that becomes completely moot when trying to communicate with the majority of the midwives because they speak a traditional Mayan language that sounds and tastes nothing like Spanish. It’s harsher sounds, stronger syllables, thicker tongues. Luckily, we had a translator there, Maria, and quite a few of the midwives also spoke both, so in the end it all worked out from that standpoint. We were also educating a couple of illiterate individuals, which made taking blood pressures difficult for them because while they could hear the sounds and understand where on the monitor they needed to note numbers, they couldn’t dictate what the number actually was – which almost defeats the purpose. Our solution? Mark on the cuff monitor which pressures indicated an emergent situation and necessitated a referral. This job requires nothing if not adaptability. After eating lunch with the midwives, they began there journeys back home – some of which would be more than two hours – and we returned back to our rooms for a quick siesta. 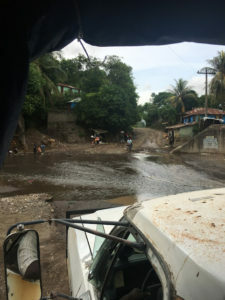 At 1530, we met back up with one another and took the bus into the town of Chisec. We could hear and see the storm rolling in, but we were determined to get in a little bit of walking in spite of the obvious incoming weather. We paid for our stubbornness and got caught in a small shoe shop during a torrential downpour. All of the people who were in town took cover under something and we just watched the streets quickly fill with water. Luckily, the shop keepers were extremely pleasant and allowed us to stay under cover until Oswaldo came and picked us up in the bus. The rest of the evening was spent putting together small packages for the midwives – consisting of gloves, umbilical ties (they don’t do clamps down here), new scissors to cut the umbilical cords with, sterile blue towels, and a couple of pairs of sterile gloves. All of these new goodies will provide the midwives with a very limited supply of some of the resources that they need – but we’re trying. These packages coincide beautifully with the educational session about sepsis and neonatal infections that will be conducted tomorrow by myself and Tamara Noy. Our teaching went well. We got to have lengthy conversations about infections and how the midwives traditionally care for their women. I think at this point we were all quickly coming to the realization that these midwives are so so so knowledgable and so passionate. It becomes much more of a dialogue and much less teaching – an exchange of treatments and options and ideas. It’s so inspiring to learn from them and to hear what they go through on a daily basis. 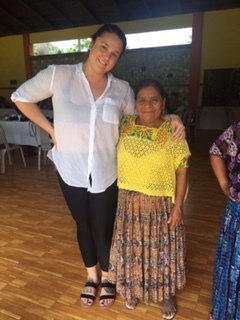 We got to do a home visit with one of the comadrones, which was very eye-opening. The woman we saw five months pregnant with her fifth child. Her husband, her four daughters, and she lived in a building that is roughly the size of typical dorm room with dirt floors and a large curtain splitting off some of the sleeping areas from everything else. There were three chickens living in the house with them and a large (I mean large) bin of corn in one corner. Even though it was small, and the family was obviously impoverished, everything was clean and well-cared for – and the woman had pride showing us where she lived and introducing us to her daughters (all through the interpreter mind). We also got to see the return OB visit, the midwife did Leopold’s (basically felt the belly to determine the size and position of the fetus) and then did a mini rubdown of the woman’s legs and belly and arms – kind of like a massage. It was wonderful to see a midwife in another country utilize similar tools that we do in the States. 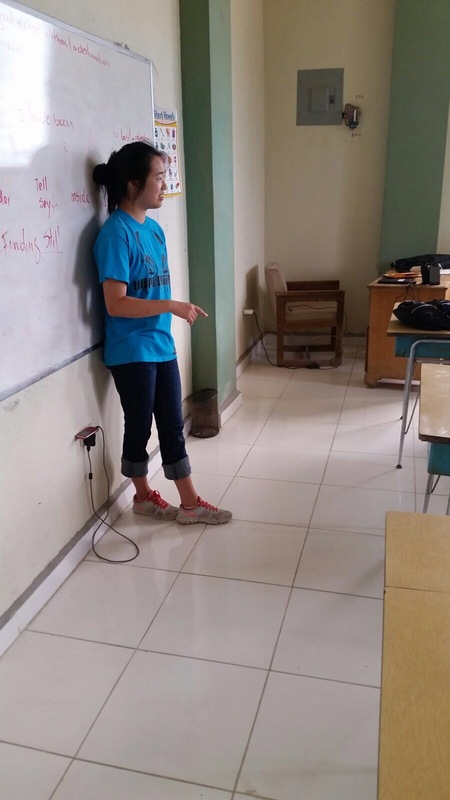 Finally, on Thursday, Chelsea and Michelle did their teaching on postpartum hemorrhage. They used chucks and poured different amounts of fake blood on to them to have the midwives determine which needed a referral and which was okay. 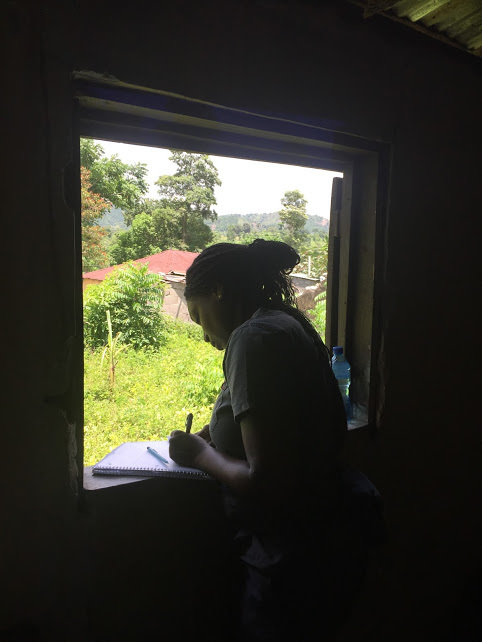 We also supplied the midwives with headlamps and showed them how to use them so that they could see when they were walking in the middle of the night and check for tears in poorly lit buildings. Chelsea and Michelle mimed a birth with a postpartum hemorrhage and asked the midwives what they would do throughout. It was a very successful learning day. 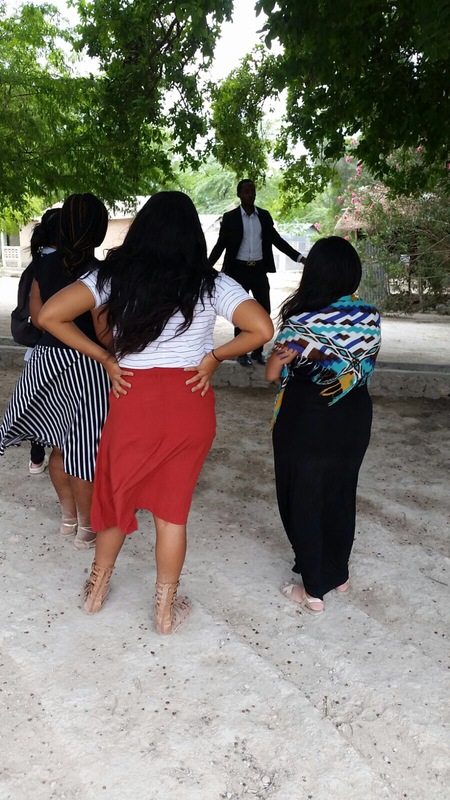 We then went a stood in a circle with all of the comadrones and began throwing a ball of yarn from person to person. The person with the yarn would share what they had learned or what they enjoyed most about the past three days, would keep a hold of the string, and pass the ball along. 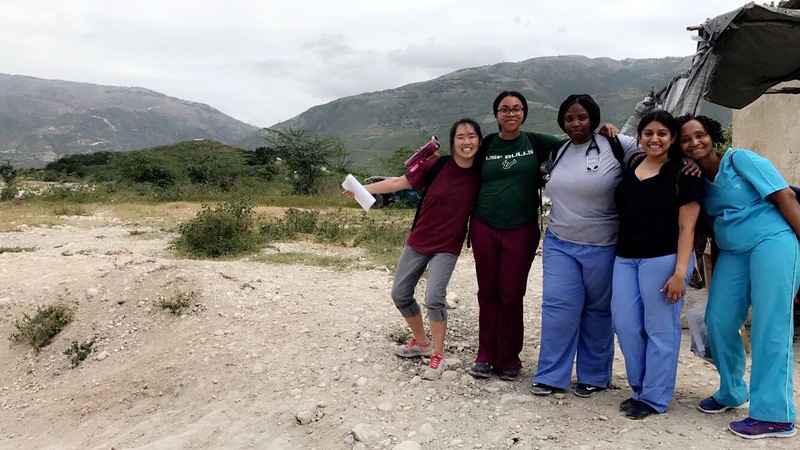 At the end, we were all connected by this string which physically exemplified the way in which we were connected by our profession and our passion for the women that we get to care for on a regular basis. 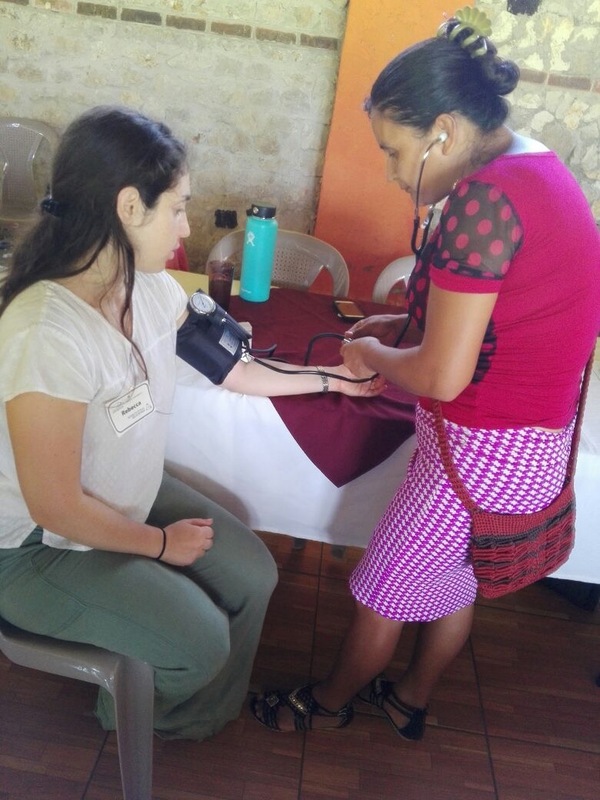 I think it’s safe to say that these three days in Chisec were inspiring and uplifting on both ends and just made me so much more excited to enter this profession. BP practice with the midwives. Erika, Hannah, and Becky teaching the midwives. 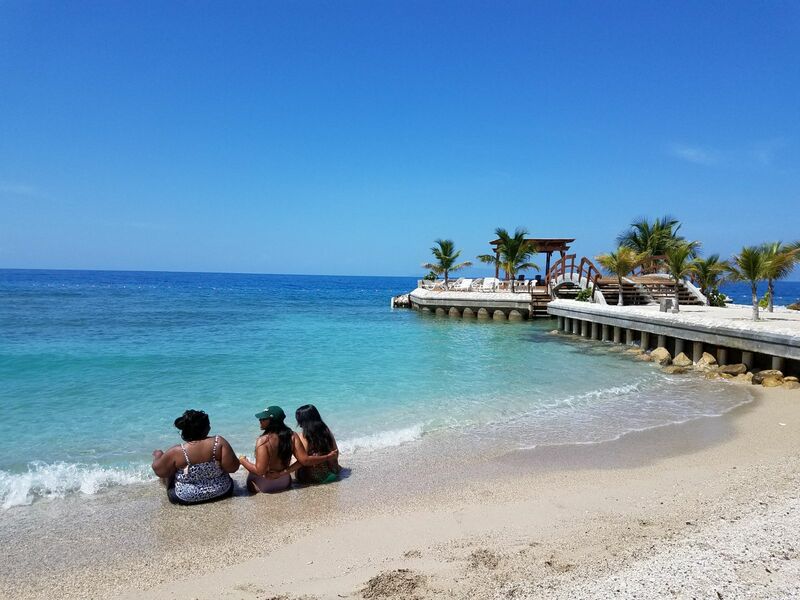 After seeing hundreds of patients this week, we spent our day off with some R&R at Moulin Sur Mer. 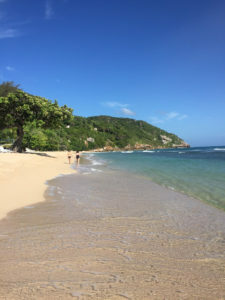 It was a beautiful beach with clear, blue waters and soft waves. Later that evening, the Foundation For Peace organized a Creole class to help us better communicate with the patients we were seeing. The patient population we saw that day was quite different from those earlier in the week. They were more educated and some even spoke English. The kids were more playful and eager to ask questions. 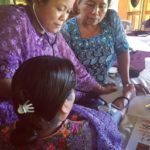 A lot of the care we provided was surrounded around patient education and prophylactic treatment. 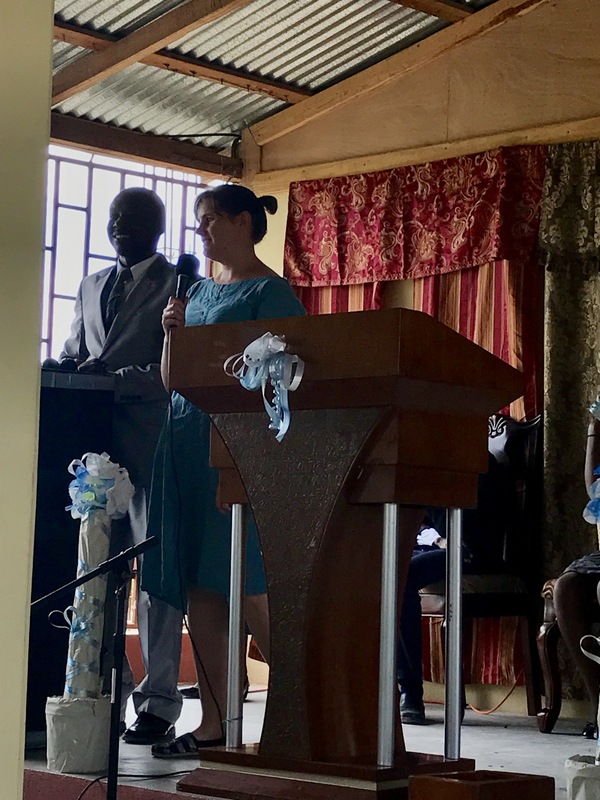 The day was filled with a great amount of teamwork as the Pastor of the church, Pastor Valentin, was present the whole day to keep things organized. 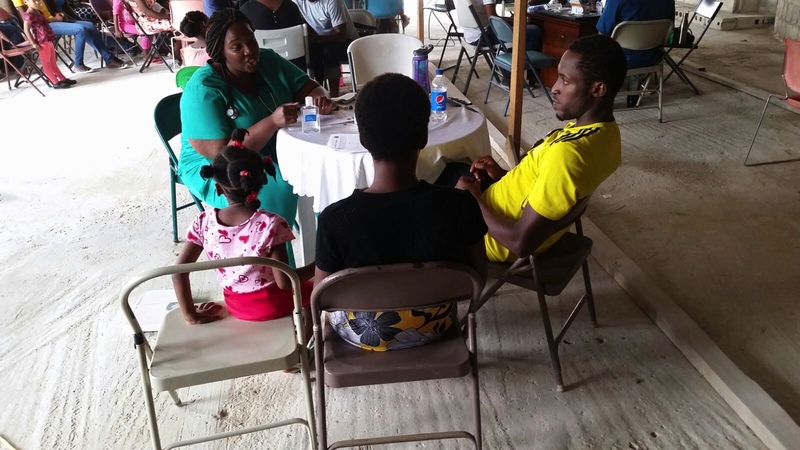 Pastor Valentin’s sister, who is a NICU nurse in Haiti, was also present to help triage and assess vital signs. We were fortunate to work on a team with many hard workers that came together to provide optimal patient outcomes!